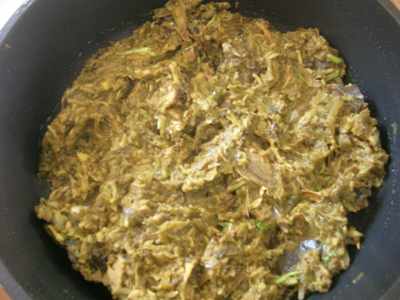 Kochur shak/taro stem with illish head is an authentic Bengali dish. Kochur shak is rich source of iron. This is one of my favourite dishes, hope you guys will like too. In my tight schedule I do some easy steps to fulfil my food fantasy. I am telling that here because kochur shak is little bit time consuming dish. First you need to boil the stems and then cook with spices. In my case I boil lots of stems together and fridge them in small container. When I want to cook it, just take out from fridge and cook it. In this way kochur shak can be handy to you. You can use prawn instead of ilish head. Even instead of desiccated coconut and coconut cream you can use 2 tablespoons coconut paste. Heat the pan with oil and add sliced onion. When onion become soft, add ilish pieces coated with turmeric and salt. Fry it about 3minutes. Add garlic, desiccated coconut, and coconut cream. Cook it till oil comes out and kochur shak. Cook it till the shak is nicely cooperating with fish and stir occasionally. Add the chillie and cook 2 more minutes. Serve kochur shak with rice.